Jennifer is a writer currently living in Albuquerque where she just completed her MFA in creative writing. She is working as a freelance writer and finishing her memoir. Set against the backdrop of turning 40, watching her sister battle cancer, and losing her father, Reconstructing My Mother is a memoir chronicling Jennifer’s journey to get to know her mother who died from cancer when Jennifer was 13, and her journey to get to know herself. Jennifer heads up DimeStories International, an online, on-the-radio, and live event showcase for short PROSE and she is the co-host (along with Merimee Moffitt) of the Duke City DimeStories monthly open mic event in Albuquerque. Jennifer is also a regular volunteer at the Children’s Grief Center of Albuquerque where she facilitates a peer group for grieving teens. 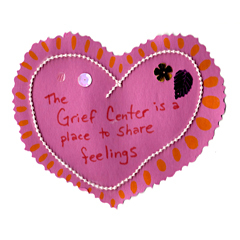 The Children’s Grief Center (CGC) provides support groups for young people ages 5 – 25 who are grieving the loss of a loved one. Support groups meet in the evenings throughout the school year at the main campus in Albuquerque’s near North Valley, as well as in southern Rio Rancho.